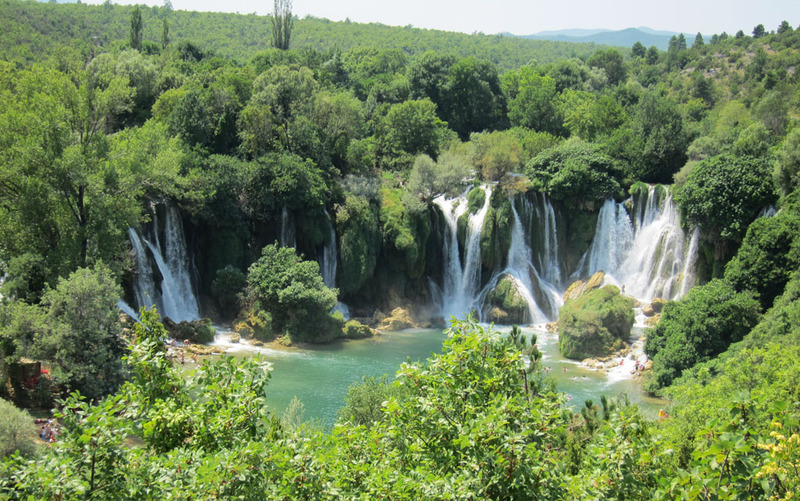 Nestled between thick, lush, green forest in the south-western corner of Bosnia & Herzegovina, the Kravice Waterfalls plunge down a horseshoe shaped canyon at a height of 25 metres into a natural emerald green pool below. The falls, which span an incredible distance of 150 metres are truly stunning to look at from a afar, yet, there I was standing precariously on what can only be described as a huge, slippery mound in the middle of the falls themselves. The landscape, not only striking to look at also provides thrills for those who seek them, hence why I found myself perched on top of an eight metre high rock, anxiously preparing to jump. Only a few moments before Nick, Georgie and I, along with our group followed our guide Bata’s direction of swimming out to the falls. Once there we clambered over moss-covered rocks, dove under waterfalls and stood under thousands of litres of falling water. As the people from my tour group jumped off one by one and vanished into the depths below, I started to feel a tad uneasy about my nearing descent. With each call for the next intrepid jumper and the constant roar of water behind me, my internal battle intensified. A combination of hesitation, frustration, trepidation, interspersed with ‘you can do it’ shouts of confidence. My nerves unfortunately got the better of me, and I moved further back in line, till only myself and two other girls remained. And then the moment came when there was no one else left but me. Standing alone on the edge, I started to think about the consequences…. How would I land? How would it feel? I had to stop thinking. I told myself that it’s just a little leap. I took a deep breath in and a deep breath out, followed by one step, two step…. Arrhhh! My moment of bravery was short lived as instead of jumping clear of the rock I lost my footing and slipped clumsily, as though on a banana peel. Then it all got a bit hazy. One moment I was about to jump and the next I was dangling over the edge being pulled back up by my wrist. Had Luke – a six foot six, larger than life Aussie – not been standing behind me waiting to jump for the second time, I would have surely fallen on the rocks below and had myself a pretty bad injury. It’s rather terrifying to think about it now and of course it was frightening then but I was in too much of a state to really fathom the seriousness of it all. Safely sitting on the rock covered in scratches and nursing an extremely sore arm, Nick comforted me. I managed to calm down after a few minutes, yet I was not able to shift the embarrassment I felt. I kept thinking what a fool I had been to let my fear consume me like that. As I looked out and saw the group swimming back to the waters edge something came over me and I somehow mustered up the courage to jump. After I resurfaced all I could think of was I had done it! And it was exhilarating. 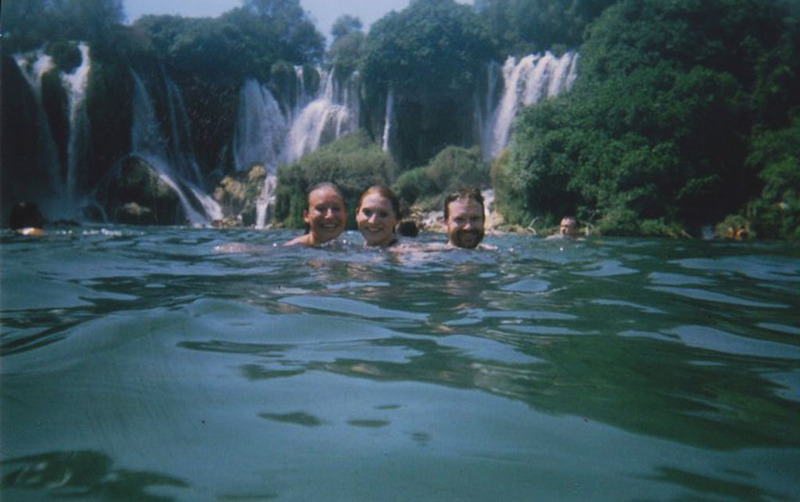 Although our trip to the Kravice Waterfalls was not without drama or incident it still ranks as one of my all time best travel experiences to date. It reminds me of how liberating an experience travelling can be, where you find yourself daring to do things that you wouldn’t normally do. The falls are difficult to find, unless you have a local to lead the way. Luckily for us Hostel Majdas where we stayed, ran an all day (out of this world) tour that took us to the falls.